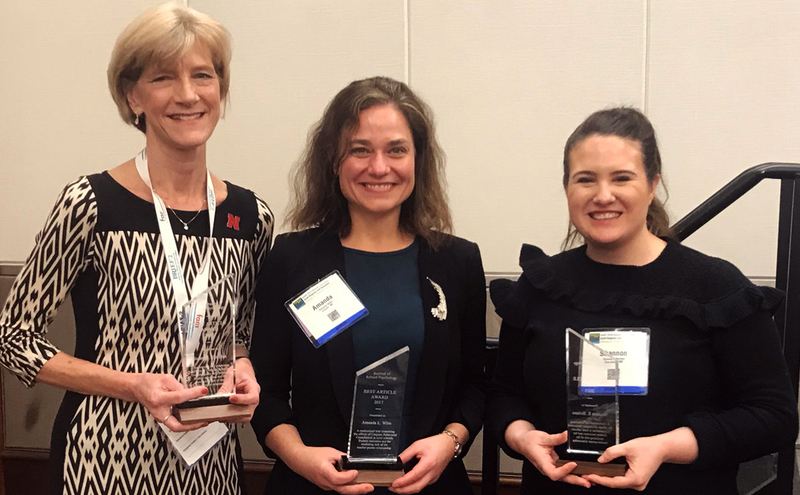 From left, co-authors Susan Sheridan, CYFS director; Amanda Witte, project manager; and Shannon Holmes, postdoctoral fellow at the University of Missouri, accept the award for the 2017 Article of the Year. A peer-reviewed research paper highlighting the success of a research-based program designed by CYFS has been named the 2017 Article of the Year by the Journal of School Psychology. The article, “A randomized trial examining the effects of Conjoint Behavioral Consultation in rural schools: Student outcomes and the mediating role of the teacher-parent relationship,” appeared in the April 2017 issue of the Journal of School Psychology. It was one of two separate articles published about the outcomes of research using Conjoint Behavioral Consultation (CBC), a program now known as Teachers and Parents as Partners (TAPP). Developed by CYFS researchers, TAPP supports strong collaboration between teachers and parents to enhance students’ academic, behavioral and social outcomes. The four-year study highlighted in the article examined how intervention focused on promoting strong relationships between schools and families in rural communities affects children’s behavioral outcomes. Research found that strong parent-teacher ties generated positive outcomes for rural children, including improved student behavior and better academic and social skills. The award was presented at the National Association of School Psychologists conference in Chicago in mid-February. During the study, data were collected from 267 students, grades K-3, along with their parents and teachers in 45 Midwestern rural schools. Within the 152 participating classrooms, teachers nominated up to five students whose disruptive behavior interfered with their learning. Students chosen for the study were divided into TAPP participants and a non-participant control group. Research measured the effects of TAPP both in students’ homes and schools. Consultants met with teachers and parents of children in the TAPP group to identify children’s behavioral challenges and their causes, then developed joint plans to implement at home and school. Teachers reported that over the course of the study, children participating in TAPP showed significant reductions in behavioral issues compared to those in the control group. Classroom observers noted greater strides for the TAPP group in appropriate behavior, such as staying on task and maintaining positive social interactions. Additionally, teachers reported better relationships with TAPP group parents than with those who did not participate. “One of the most important findings of this study is that the relationship between parents and teachers was the mechanism, or active ingredient, by which this collaborative process served to support students and solve problems,” Sheridan said. The study was funded by the U.S. Department of Education’s Institute of Education Sciences. Others involved in the study included Mike Coutts, Amy Dent, Shannon Holmes, Gina Kunz, Amanda Witte and ChaoRong Wu. The Journal of School Psychology has granted promotional access to the article through Aug. 19.